The brief was precise in its detailing; we were to replicate the office furniture of a U.S company’s Atlanta based office from emailed photos and descriptions. This being white desks with tall under desk pedestals, black framed mule-coloured desk mounted screens and colour matches in all other aspects. An existing Brighton office and in particular the new Dublin office, had a full Desk Warehouse fit-out from boardroom tables to break-out, bistro and reception areas. 'New Look Canteen' A complete new look was required for this company's staff canteen.The Managing Director wanted everyone to interact more during their 'break-out' time! Picnic benches, barstools and square reconfigurable tables were chosen, so as they could be pushed together, to give a greater degree of social interaction for larger groups of the team. Complementing teal green and walnut was the preferred finish giving a relaxed and modern feel. Research and development company, completed their new offices with a combination of white height adjustable desks and bench style desks together with white framed mesh backed chairs. Just one of our happy customers. Rapid expansion completed with corporate colour office furniture installation. This Facilities Management Company was really pushed for space in the office. We were able to suggest the perfect solution - Slim line 600mm deep desks and slim line under desk drawers to suit. Double monitor arms were fitted to the desks giving a really flush neat working area. This 60 workstation project was for an English company setting up for the first time in NI. After the client visited our extensive showroom and seeing the exact office furniture and seating that had been proposed it was a quick decision to move the project forwards. All 60 desks, chairs. pedestals and meeting room furniture was installed by our expert team of uniformed fitters within a two day handover window. A long standing client in the North of England continues to expand opening another office. 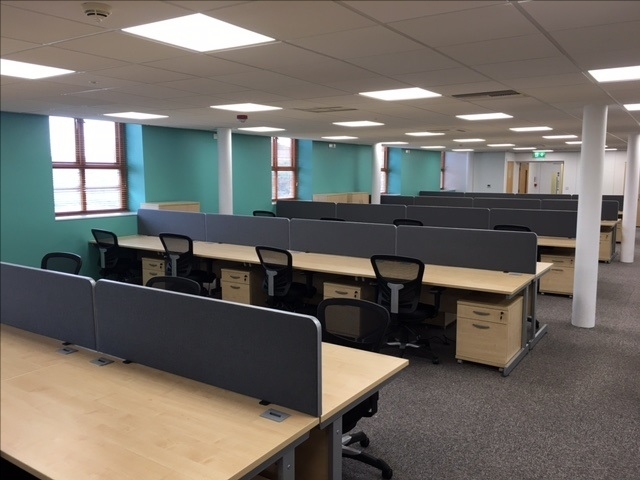 Deskwarehouse supplied the same white desks and desk mounted screens in the company’s corporate colours. Healthy back mesh chairs complemented the overall look. This company availed of our ‘white glove’ delivery and installation service using our own fitters on one of our scheduled GB runs. A real natural walnut 3mtr boat shaped table and matching four door credenza cupboard was installed for a new EuroSpar Filling Station meeting room. Suppliers and staff alike can now enjoy the luxury of a real wood environment to hold their meetings. Comfortable leather boardroom chairs were supplied to complement the overall look.